The Mets have dropped four straight games as they once again turn to their young ace, Matt Harvey, to stop the bleeding. So far the Mets are 5-0 in games that Harvey starts as opposed to 5-13 when anyone else takes the mound. Similarly to Steve Carlton’s 1972 season with the Phillies, Matt Harvey’s starts are quickly becoming known as “Win-Day” for this struggling team. Although I expect the Mets to win more than that clubs 59 games, it does have that same feeling. This weekends series against the Phillies was downright awful, there’s no other way to put it. Watching these games made you feel as if the season was over already and it’s still April. Even this early in the season, each and every one of Harvey’s starts feels like a must win game for this team. There has been no other excitement and the team plays with a different level of energy in games that he starts. It is a lot to ask a 24-year-old in entering his first full season to be the stop-gap for losing streaks, but he seems to thrive on that “must win” mentality and wants the ball in these situations. Whether the Mets wants to admit it or not, we are all aware that this is a rebuilding year. The best thing this team has going for them is Matt Harvey, we can only hope these starts coming during extended losing streaks will be good experience for him going forward. With the way this team has been playing as of late, Harvey could be seeing himself getting plenty of starts in these type of situations. He does not accept losing and clearly strives for greatness. This club may not be on that path just yet, but Harvey is. Although this game will not have the same hype that the Strasburg match-up did, Harvey faces another young promising starter in Jose Fernandez. The Marlins have high hopes for the 20-year-old and tonight could be the first of many head-to-head match-ups for years to come. 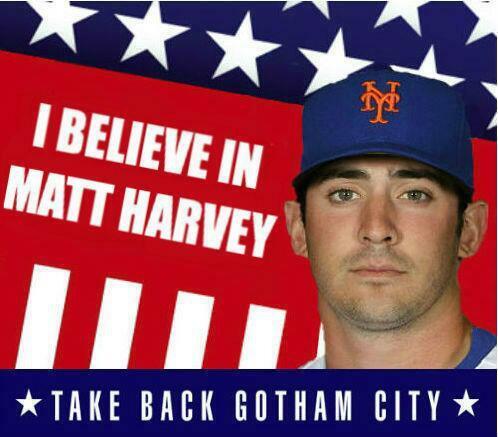 While I fully expect Harvey to continue his dominance against the lowly Marlins tonight, it is impossible to expect the Mets to win each and every one of his starts. If the Mets have any hopes of staying relevant this season they will need to improve their performance the four games in between Harvey’s starts, and fast. The only reason why I am watching a Mets game is to see him pitch. From the lack of fielding to the anemic offense, the only thing that will come out of this season is to watch young players develop and succeed.